Find Hilton Austin Airport deals, discounts and special offers. The only hotel on the grounds of the Austin airport, this hotel is set in a former Air Force strategic command center. This lakeside resort and spa is all-inclusive with 3 healthy gourmet meals daily. The Lady Bird Lake-side location allows guests to "get away from it all" near popular downtown attractions. Bat Bridge is right outside this Four-Diamond, Lady Bird Lake resort hotel. A Texas Hill Country hotel surrounded by both natural splendor and sophisticated dining and shopping options. Opened in 1886 by cattle baron Jesse Lincoln Driskill, the hotel features original art, oil paintings, & antiques. A 14 story hotel with 303 guestrooms and suites, spa services, and a large indoor/outdoor pool. Luxury hotel with a heated rooftop swimming pool, high-speed internet and massage services. Newly renovated, the Hilton Garden Inn Austin Downtown offers 254 rooms, central location, and a restaurant. Located next to the Capitol, this 362-room hotel is pet-friendly and offers views of downtown Austin. This resort is on 4,000 acres and includes four championship golf courses, a luxurious full-service spa and more. Inn features 10 guest rooms surrounded by balconies, porches, a large deck and covered with shade trees. This landmark estate features 48 guest rooms & suites and has just undergone a multi-million dollar renovation. 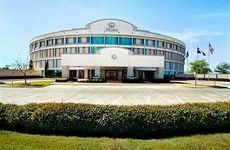 Conveniently located near the airport, this hotel has an outdoor pool, fitness center and a restaurant. Just ten minutes from downtown Austin, this hotel offers convenient access to many area attractions.